Guidelines from Human Factors research for optimising human performance and reducing fatigue-related risks. Breaks from operational duty are an important factor in the management of fatigue. But as highly committed and professional operational staff often perform several secondary tasks and activities – inside or outside the ops room – breaks can become a victim. Breaks seem to be used for a wide variety of activities. A controller once said to me that working through breaks was often necessary for him to complete his secondary role…in safety management. This tendency to use breaks to perform tasks that add to fatigue, rather than reduce it, can increase over time without being noticed. In the end it may seem like the normal way of working. It is too easy to forget that the important role of breaks in managing fatigue – visual, mental and physical – and of course in managing stress. The issue of fatigue is a core issue in human factors. So what activities are acceptable from this point of view? Anyone with some exposure to the field of human factors will not be surprised to hear that there is no black and white answer. But some general guidelines can be offered from the research on fatigue and vigilance. Let’s start by asking, what is the purpose of a break from operational duty from a human performance viewpoint? Operational tasks are often visually demanding, involving monitoring the outside view, the situation display, or other screen-based work. This work contributes to visual fatigue, even when you are not particularly physically fatigued. Operational work can also involve intense periods of typing, writing or other inputs. You may notice how this brings about feelings of tension in the hands, arms and shoulders. Similarly, the work can often involve static postures, and so more general physical fatigue or discomfort can result. In high workload periods, mental fatigue can build up. But low workload periods can seem even more mentally tiring, and it is during these times when vigilance can really suffer. So breaks are needed to recover from a variety of demands and the needs from a break will vary. 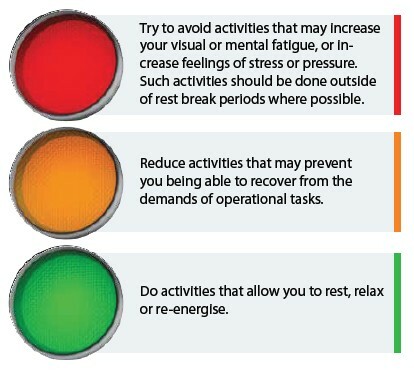 Depending on the operational activity, you may need to rest, or relax, or re-energise during the break. We could put break activities into three categories, and as there are no black and white answers, we’ll call these red, amber and green activities. There are some activities that we know (from research and common sense) should be avoided during breaks, or at least minimised. In particular, activities that increase visual or mental fatigue, or increase feelings of stress or pressure, can prevent recovery. Tasks that are likely to be stressful may cause worry or preoccupation and so can even affect your work before the break. In general, such activities should be done outside of break periods where possible. Activities that may fall into this category might include assessments, interviews, important reports, or even difficult conversations. But other types of work which are intense or particularly important are also best done outside of breaks. Managers and staff need to arrange additional time for such activities, where possible. Many activities that are sometimes performed during breaks are often OK in moderation. These really depend on the operational activities before and after the break. In general though, activities should be reduced where they are similar in nature to the operational work, for instance visually demanding, involving a lot of manual inputs, or time-pressured. Let say you have had a very busy period involving high levels of concentration and lots of keyboard or touch screen work. It would make sense, during the break, to reduce or minimise time spent internet surfing or completing detailed computer-based administration. Similarly, if you have had a very busy session on duty, then the break is probably not the time to rush around doing other time-pressed activities. But if you have had a very quiet period, the same activities could help you re-energise. Where it is necessary to do activities that are similar, physically or mentally, to the operational tasks, it is advisable to take a reasonable period of ‘green time’ to recover before going back on duty. The best kinds of activities to perform during breaks are usually different to the activities undertaken while on duty. These ‘green activities’ will allow you to rest, relax or re-energise. They might include restful or relaxing personal time, social activities, or light exercise. They may be individual to you, but will certainly depend on the nature of the operational work. A period of ‘green time’ taken immediately before going back on duty, and preferably outside the ops room and away from a computer screen, will help optimise performance. So when it comes to breaks from operational duty, changes in activity are the key to reducing fatigue-related risks. Of course, how breaks are spent is only part of the picture. The timing and frequency of breaks are also important and, to a lesser extent, their duration. These broad guidelines would ideally be incorporated in an overall policy or risk management system for fatigue, including provisions for time to perform secondary tasks that may present a fatigue risk. Until then, perhaps managers and operational staff can put the guidelines into practice to help optimise human performance, and maintain safety. This entry was posted in Safety and tagged fatigue. Bookmark the permalink.